Gboard —not to be confused with Google's $4,999 Jamboard — has been updated to bring Android typists new ways to get their messages across in a timely manner. The updated mobile app now includes better predictive phrases for English, filling in sentences nearly instantly rather than one word at a time. For example, bringing up “looking forward” nets the potential suggestions "to it" or "to seeing" so you can get responses out faster. 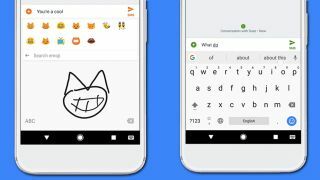 Speaking of time-saving, Gboard also now includes a revamped emoji search box that lets you look up your favorite symbols simply by drawing them. This saves you time in having to guess what exactly to type in to find that perfect (or not) graphic. Finally, using the built-in Google search option on Gboard now yields multiple results, making looking up YouTube videos, recipes, directions, or potential restaurant trips a relative breeze, rather than having to suspend your conversation to open up a web browser. Gboard's latest update is rolling out now to Android users via the Google Play Store. The update also brings gesture typing and suggestion support to a wealth of new languages, including Azerbaijani (Iran), Dhivehi, French (Belgium), Hawaiian, Maori and Samoan, as well as simple keyboards that support typing in Dzongkha, Ewe, Navajo, Tsonga, and K'iche'.